Jaipur, the pink city is a reservoir of excellent architectural wonders which gives us a view of the Country’s grand heritage and legacy. The city designed by Vidyadhar Bhattacharya was built under the patronage of Maharaja Jai Singh II of Amber in the year 1727. The name “Pink City” derives from the fact that when the Prince of Wales visited Jaipur in 1853, the city was painted entirely in pink to give magical charm to the city. There area a large number of forts and monuments in the city making it a wonderful place to spend a vacation. The three most antique forts in the city include the Amber Fort, Jaigarh Fort and the Nahargarh Fort. 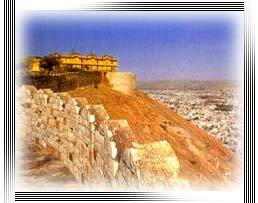 We at Touristplacesinindia.com provide you with complete information on all that you want to known about Nahargarh Fort. The Nahargarh Fort locates among the Aravalli Mountain Ranges and offers a fabulous view of the Pink City. The Fort which lies 6 km North of Jaipur just below the Jaigarh Fort served as a refuge to the Europeans during the revolt of 1857. The Fort is also known as the Tiger Fort and was built keeping in mind that it would serve as an important structure to provide security to the city of Jaipur. One of the major appeals of the fort is the spectacular view of the Mansagar Lake and its surrounding area. The Fort looks best in the midnight and there are cafeterias inside the fort which offers snacks and beverages to the tourists. In spite of the fact that the older parts of the Nahargarh Fort is in ruins the further additions to the fort are still well preserved and speaks about the majestic past and the Royal Heritage. There is a legend behind the naming of the fort. The fort was named after a prince whose apparition used to irk the construction site and so a “tantrik” was called to whom the spirit confessed that it would leave the fort only if the fort was named after him. Among the splendid buildings inside the Nahargarh Fort, the most prominent one is the “Madhavendra Bhawan” which was built by Sawai Ram Singh II. This Palace has a sequence of interconnected rooms with colorful corridors and hallways and once served as a picnic spot for the members of the Royal Family.